Wilton Park was established as a forum for global dialogue 70 years ago and has been proud to call Wiston House its home for 65 years. 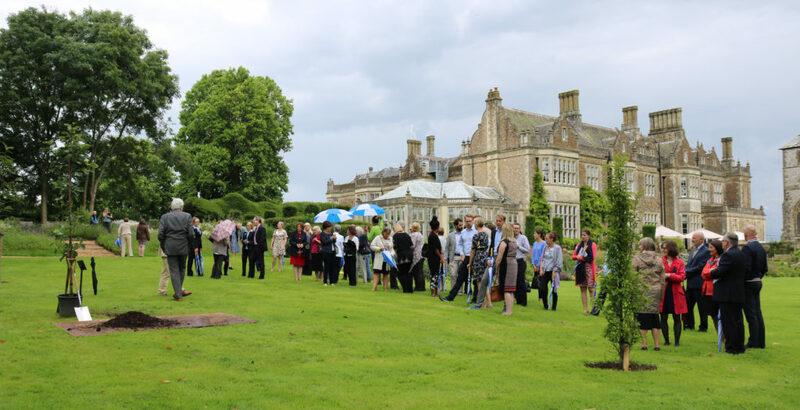 Yesterday Richard Burge, the Chief Executive of Wilton Park and Harry Goring, the owner of Wiston House marked these anniversaries by planting a commemorative magnolia tree in the beautiful grounds. Despite the unseasonably showery weather, a large number of guests – including former employees and current conference participants – gathered to watch the ceremony. We are currently hosting the annual British German Forum for young leaders. Established by former leaders Margaret Thatcher and Helmut Kohl, the first meeting took place at Wiston House 30 years ago this summer. Discussions on the future relationship of Britain and Germany provided the perfect backdrop to celebrate the first Wilton Park dialogues on rebuilding democracy in post-war Europe in 1951.